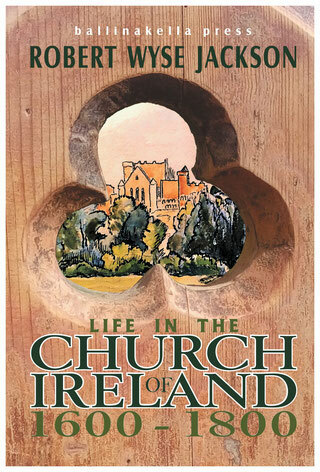 I missed the recent launches of Life in the Church of Ireland 1600-1800, a new edition of a book by the late Robert Wyse Jackson, former Bishop of Limerick. This enticing 250-page book, published in recent weeks by Ballinakella Press, Whitegate, Co Clare, is the result of painstaking research into the turbulent life of clergy and laity of the Church of Ireland during political upheavals, the influences of plantation and of ecclesiastical establishment. Robert Wyse Jackson, one-time lawyer, country priest and eventually Bishop of Limerick, had a deep understanding of both rural and urban life in the Church in the 17th and 18th century Ireland. In this book, he writes with confidence and uses contemporary quotations to present a true, amusing — even compulsive — read. John Wyse Jackson, who runs the fascinating Zozimus bookshop and café in Gorey, Co Wexford, had invited me to write the introduction to this new book, which received an interesting notice in The Irish Times last Saturday [26 May 2018]. Robert Wyse Jackson was a barrister before he was ordained and Dean of Cashel before he was returned to Limerick as the diocesan bishop. He is remembered half a century later for his humorous approach to history and as a raconteur. These experiences in their unique combination mark the very individual approach to his stories and vignettes in this book. It is not all about priests and bishops, for he also introduces us to some curious preachers, parish clerks and churchwardens; nor is this solely a series of tales within the Church of Ireland, for he introduces us to a variety of ‘non-conformists,’ from Limerick Quakers to Cork Huguenots and Waterford Presbyterians. Nor, is this all about men either: the letters of Mrs Delaney provide a taste of society life in Georgian Ireland, and the autobiography of Elizabeth Pilot is an introduction to the values that shaped an evangelical enthusiasm for mission, at home and abroad. Jackson is kind to the gaming and carousing prelates he introduces, and historians would be less willing to accept his judgment that Adam Loftus was ‘good and conscientious.’ But he admits that in the days of patronage and preferment, long before formalised theological education, many of these men were unsuited for their primary tasks in life of administering the sacraments, preaching the Gospel and providing pastoral care. An overwhelming number seldom took services, and even fewer celebrated the Holy Communion or performed Baptisms or were literate enough to pick their way through the pages and rubrics of the Book of Common Prayer, leaving their churches in a pitiful state of neglect. When the celebrated William Bedell became provost of Trinity College Dublin in 1626, he found to his horror that Holy Communion had not been celebrated in the college chapel for 11 years. John Bramhall, Bishop of Derry, wrote with equal horror to the Bishop of London to complain that the altar in Christ Church Cathedral, Dublin, was used as a ‘common seat for maidens and apprentices.’ But this is also the story of a church that suffered and survived the massacres of 1647 and suppression by Cromwell in the 1650s. Later, we come across detailed accounts of the military roles of chaplains during the Jacobite or Williamite wars, and corrupt bishops such as Thomas Hacket of Down, who skilfully combined simony and forgery with almost continuous non-residence in London. Yet, here is a compellingly instructive image of a damaged Church making great efforts to pull itself together. This is the Restoration Church of Johan Bramhall and Jeremy Taylor, erudite church of William Bedell, Narcissus Marsh, Jonathan Swift and George Berkeley … and of Oliver Goldsmith’s parson. There are ‘entirely crazy divines’ like Frederick Lord Hervey, Bishop of Derry, who for 20 years startled Europe, and heretics such as Bishop Robert Clayton of Clogher, accused of Arianism and Unitarianism. But they are more than counterbalanced by conscientious figures such as the nonjurors Henry Dodwell and Bishop William Sheridan who preferred exile to betraying a solemn oath. Jackson draws creatively from tales heard in his own diocese. Archdeacon John Brown, who was one of my predecessors in Rathkeale, was a conscientious archdeacon of Limerick, but equally conscientious as Rector of Rathkeale, where he also paid a curate £40 a year. Last week I was invited to speak at the launch in Limerick of Patricia Byrne’s new book on Edward Nangle and the Achill Mission, The Preacher and the Prelate. But the debates stirred up by Nangle and his Achill Mission and their protagonists often detract from the good news and developments that are taking place around Saint Thomas’s Church in Dugort, which is Nangle’s lasting legacy on Achill Island. At the General Synod in Armagh earlier this month, Maedbh O’Herlihy shared with me her vision for the Sacred Path, a Centre for Spirituality that is an initiative of the Church of Ireland in the Diocese of Tuam, Killala and Achonry. As a centre for spirituality, the Sacred Path is planning to offer a programme of retreats, workshops and pilgrimages. ‘The retreats may be silent, individual or group, facilitated, or simply accompanied through gentle direction,’ she promises. So something new is coming out of Achill this summer. It promises to be a new spiritual awakening in a way that Edward Nangle could have imaged a century and half ago, and a blessing reaching far beyond the parish and diocese in the Church of Ireland.